CALGARY—Nestled beneath the scattered peaks overlooking Squamish B.C., a stone’s throw from the shore of the calm Pacific inlet known as Howe Sound, one Canadian company is quietly nearing the completion of a facility that could rewrite the book on hydrocarbon fuel, and potentially turn back the clock on climate change. Often pegged as a dirty technology, only somewhat cleaner than coal, hydrocarbon-based fuels—such as diesel or gasoline—are considered in many circles to have outlived their usefulness, causing more damage to the environment than they give back as simple and accessible forms of energy. 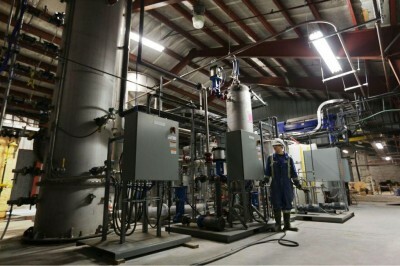 Despite the stigma, Calgary-based Carbon Engineering is not convinced the age of hydrocarbons is necessarily over. But unlike a conventional energy company, the six-year-old cleantech outfit is planning to leave the petroleum in the ground. It may not be the easiest or most conventional way to produce hydrocarbons, but Carbon Engineering is wholly dedicated to pulling – or scrubbing – carbon dioxide from the air and using it to produce synthetic hydrocarbon fuel that has an ultra-low or no carbon footprint. “If you’re just looking to produce CO2 that somebody can use in an industrial or a commercial setting, there’s cheaper ways to get it than scrubbing it out of the air,” Geoffrey Holmes, business development manager at CE, said. But as CE’s engineers know, and is becoming abundantly clear to energy companies with high carbon footprints, changing emissions regulations and environmental impact costs are quickly changing the cost equation of traditional energy. To scrub CO2 from the air, CE uses what is known as a contactor. First, large fans push regular air through plastic sheets that are pumped full of a liquid solution designed to capture carbon. The CO2 is absorbed into the solution and collected in a large tray. The remaining air is filtered off, while the CO2-rich solution is funneled and pumped toward the regeneration stage. The regeneration process isolates the CO2, allowing it to be used to produce synthesis fuels or stored. The liquid solution can then be pumped back to the contactor and reused. CE’s system uses thermal energy for the majority of the CO2 extraction process. Its demonstration plant will be powered by natural gas to generate the required energy, but CE noted as solar prices continue to tumble, all stages of the process could run on renewable energy. In that scenario, when the synthesized hydrocarbon fuel is burned, its CO2 emissions would be 100 per cent offset by the CO2 captured to produce it. Even if the company uses natural gas to meet the thermal demand and solar to power the electrical and fuel synthesis equipment, however, the process can reduce the carbon footprint of hydrocarbon fuels by 85 per cent. “This system can, in principle, either be used to provide low-carbon fuels that help de-carbonize the transportation sector, in which case that actually might be cheaper than a lot of our other options, or it’s also a system that in the future be used to compensate for emissions that are more costly or difficult to mitigate at source,” Holmes said. 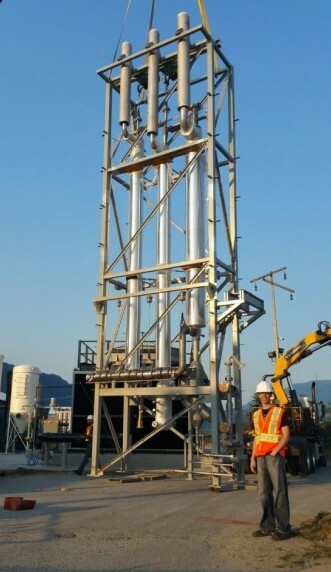 “Let’s say you’ve got a whole lot of little sources of CO2 that you just can’t capture or alter the equipment to emit less or whatever, you could in principle build one air capture plant to capture the equivalent amount of emissions… that may be a cheaper solution than applying a separate fix at each individual source,” he added. One of the major—and often overlooked—issues surrounding replacing oil and gas, is the massive investment required to replace existing infrastructure. Though low-carbon or carbon-neutral fuels are playing an ever-increasing role in the world’s energy mix, and carbon taxes as well as cap and trade programs are cropping up in Canada and in many jurisdictions worldwide to incentivize the change, traditional hydrocarbons still make up the most significant part of the world’s energy consumption. According to the most recent International Energy Agency data, oil accounted for 40.7 per cent of the world’s total energy consumption in 2012. CE’s synthetic hydrocarbons, with a significantly lower or even neutral carbon impact, would leave existing infrastructure intact—not requiring every combustion engine on the planet to be scrapped or converted—and allow hydrocarbons to remain part of the world’s energy makeup at a fraction of the environmental cost. And though synthesizing greener fuel makes up the backbone of Carbon Engineering’s business plan, the company has also investigated one alternative strategy for its technology that would turn back the clock on climate change. “It’s one of the very, very few approaches that could sort of wind the clock back in terms of CO2 emissions in some future scenario where we’ve made drastic cuts and we’re finding out this isn’t enough,” Holmes said. 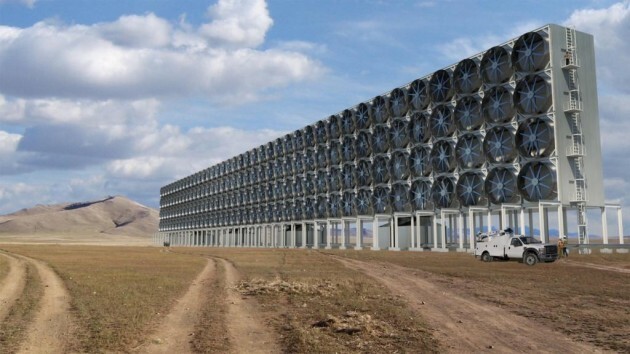 Though CE made clear it would rather “deploy this technology alongside all of our current suite of options to drive emissions to zero more quickly than to wait and use this in some future scenario to pull carbon back out of the air,” the technology could potentially be used to extract CO2 from the air on a large scale and store it, effectively eliminating one of the key drivers of climate change. CE’s pilot project is designed to scrub only two tons of CO2 from the air daily, but the company said a full-scale facility would be capable of pulling as much as 1 million tons of CO2 from the air per year. 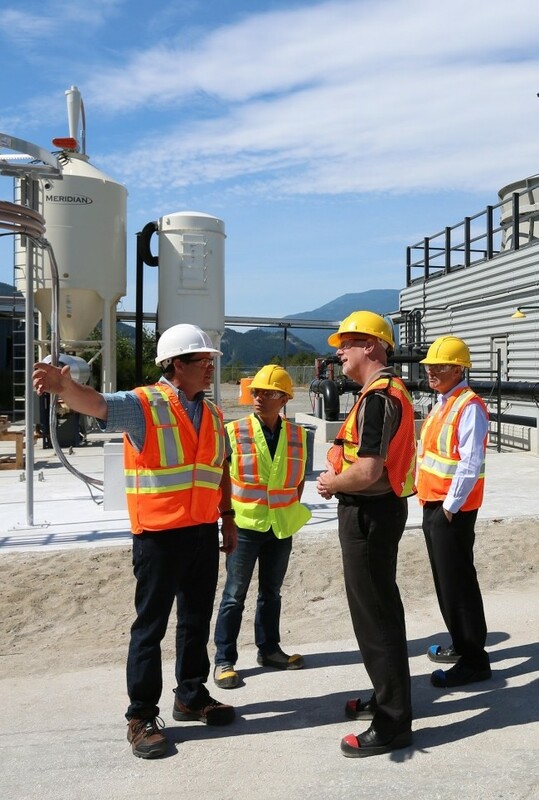 The company’s demonstration plant is nearly complete and is expected to come online in the coming months.